When you think about public transportation, what is the first thing that comes to mind? Chances are it’s not “relaxation.” Public transport is a bit of a nightmare almost everywhere in the world, whether because of overcrowding, expensive tickets or erratic schedules. 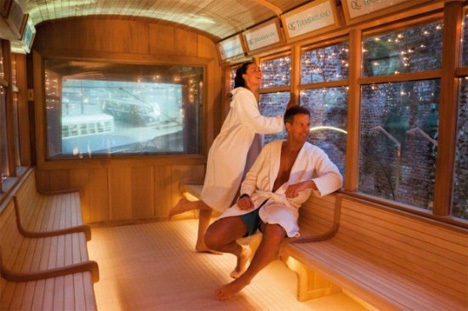 Italian public transport company QC Termemilano wanted to prove that public transportation can actually be relaxing, so they built what is possibly the most relaxing train car in the world: the sauna tram. From the outside, the car looks like any other. Even on the inside, its beautiful windows and rich wooden benches were kept intact. 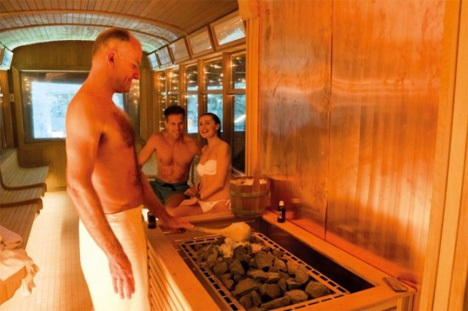 The historic trolley car was fitted with a fully functioning sauna (and supplied with some scantily-clad beautiful people for the photo shoot). The car is an attraction for visitors in the heart of Milan, but although it is placed on its own set of genuine tracks, it doesn’t actually go anywhere. Which is a pity, since this is one way to ensure that any commute is stress-free and enjoyable. See more in Mass Transit or under Transportation. February, 2011.